Electric Warriors #2 review: The Battles Begin – AiPT! War Cry and Deep Dweller learn what it truly means to be an Electric Warrior of Covenant! Electric Warriors is a really fascinating endeavor. Trying to bridge Jack Kirby’s legendary oeuvre at DC comics, primarily Kamandi, with the conventional DC timeline and progression as we understand it, to lay the pathway to legion, whilst staying true to all that came before? Certainly not your average project, nor is it easy. But Steve Orlando and Travel Foreman manage, striking a great balance of the fresh and the new, with just enough of the past sprinkled in to make an incredibly distinct work that could only exist in the DC world. Issue #2 explores the world and systems of Covenant, where our protagonists, War Cry (Ian Navarro) and Deep Dweller (Kana) arrived at by the end of the first issue. At the Crown City of Covenant, their battles are set to begin. The story opens with a monologue by Ian, as he goes through the events up until this point and then we’re met with a magnificent spread depicting their welcome parade. Travis Lanham, Travel Foreman and Hi-Fi present the book with such style, dynamism and personality and nowhere is it more evident than in this spread. A gigantic ‘Chapter 1’ sits in the top left corner, setting up the structure of the issue, much like with the previous one. Lanham’s lettering work throughout the series thus far has been a delight, as he makes every ‘Rumble,’ ‘Roar’ or other sound or bit of dialogue come alive with sheer brilliance. The Gilded, bloodthirsty rich who watch and bet over the conflicts, then detail the two protagonists’ powers for the very first time here. Deep Dweller, bearing the seal for Liberty, is granted the power to manipulate darkness and shape-shift through the Electrogenesis — a process where in a warrior is imbued with an ‘electric seed’ that grants powers. Meanwhile War Cry, bearing the seal of Freedom, is granted the power to manipulate sound through his Electrogenesis. We’re also met with two other Electric Warriors at this point: Serene of Khundia, who wields impeccable defensive power and durability and The Dominator of The Dominion, whose bio-energy is explosive. With this, the stage is set and we move to the battles that determine so much around the cosmos. Every civilization fights to settle a dispute, with something to lose or to gain at every turn. War Cry duels a Saturnian shape-shifter with a massive chunk of Earth’s food supply (Gingold Grain Stores) at stake. As the battle begins, War Cry only has Superman’s cape protecting him and he struggles to utilize his sound-based powers. This is where the team really lets loose, giving us 12 panel grid pages of absolutely brilliance. Lanham really gets to dig in and represent the various sounds in the story, playing into War Cry’s power-set, through his lettering. It’s an inspired approach and a touch most might not think to use, but the team goes that extra mile to appropriately convey, visually, War Cry’s state and experience. Things slow down during this specific sequence, with every beat becoming even, until the big explosive panel in the next pages, where War Cry falls. It’s the really small but fun bits of storytelling from the team that really make everything shine. After his dreadful loss, leading to Earth’s loss of a major food source, we cut to War Cry waking up looking at a purple alien. The being exclaims that he’s looked through War Cry’s memories and knows his secret — he is not the chosen warrior. He is not Oscar Navarro, he’s Ian, the twin brother. Hailing from the Vrang fleet, the being is another Electric Warrior and is dubbed Interceptor. War Cry is enraged upon this breach of privacy and the two have a brief struggle, until they knock one another out. Then we move to The Monolith, the core base of Covenant and we see footage of battles that occurred simultaneously with Ian’s. Kana won her battle against a Daemonite. Serene, The Dominator and Interceptor all also managed victories against the warriors of Sabrom, Yoongar Fleet and Rojira, respectively. The Lord Preceptor of the Covenant, the being at the heart of it, comments on the foolish nature of earth and how they must learn. His identity was the big stinger of #1 and it’ll certainly be interesting to see what he has to play, since Firestorm has a fascinating power-set and history. Serene and The Dominator then meet War Cry and Interceptor, carrying them off to meet Orthus, the longest surviving Electric Warrior. Orthus offers then counsel and help and despite War Cry’s doubts, he informs the human ‘Electric Warriors fight separately…but survive together.’ Kana, having accepted Orthus’ kind proposal then uses her natural regenerative powers and manages to heal Way Cry’s injuries, despite his protests that he needs no help from a ‘beast’. But since she shared her ability to heal, she must also share the pain of the one she helped. War Cry, who’s consistently been hateful and derogatory of the animal kingdom beyond humans is shaken by this act of kindness. There’s a brief moment of unity, before the announcement of Earth conflicts emerges. The humans and the animals are fighting over the food supply and thus there remains only way to resolve the issue. Electric Warriors of Earth might duel one other, an event never before seen or heard of. And so ends this installment. 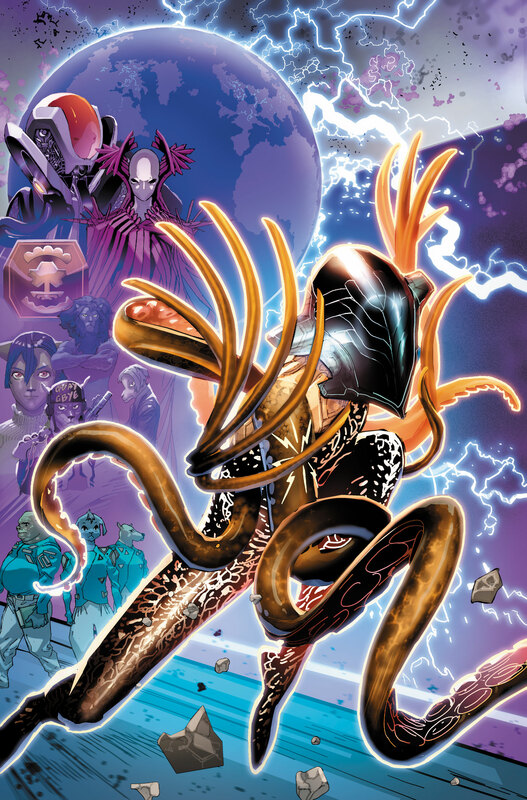 Electric Warriors really, truly feels like an evolution and true next step for scribe Steve Orlando. Much in the way Mister Miracle was for Tom King, this is a title that firmly brings together all of Orlando’s passions, strengths and sensibilities under one project, while firmly building off the best elements from his past works. Whether it be the brutal, immersive and incredibly fleshed out setting mired in secrecy or the protagonist fighting for family, much like in Crude, the incredible sci-fi action moments and Wildstorm touches present in Midnighter or even the deep, expansive DCU lore and quirkiness at the heart of Justice League of America, it’s all here. Electric Warriors is very much a synthesis of Steve Orlando thus far as he progresses forward and evolves, breaking into new spaces. It’s a title that fits incredibly well into his niche and plays to all his strengths as a writer that it’s a delight to see him pull it off. And the rest of the creative team is absolutely brilliant as well. The book could not work without Hi-Fi’s lovely colors, Travel Foreman’s incredibly idiosyncratic visuals and designs or Travis Lanham’s stylish and stellar lettering. Foreman brings an almost-Tron aesthetic to some of the looks at times, whilst still making something wholly unique and the rest of the the team runs with it to make something truly remarkable. Orlando’s spoken on how video games are certainly an influence, specifically Overwatch and that certainly comes through as well. The core themes of conflict and struggle for unity, especially between great empires is a core theme for the title, which is no surprise. This world has to lead to Legion of Super-Heroes eventually and for that world to come about certain progresses have to be made. And Electric Warriors capitalizes on that, examining the truly painful struggle of that. The cosmic dark ages are a fascinating time as depicted by the team here and the way they manage to frame the entire core idea through the smaller conflicts is impressive. Electric Warriors #2 delivers and the creative team works in the Kirby spirit and tradition by breaking new ground for the universe. Popping out big ideas every other page, wherever possible and pushing things forward to speak to the now.